One of the things that can make or break a sweater is your armhole depth. If it’s too tight, your sweater will bunch under the arm (not to mention be very uncomfortable), if it’s too loose your sweater can look sloppy. On my Ravelry group we run video sweater KALs several times a year. The KALs are filled with video tutorials and how tos (exclusive to the KAL participants) and there’s always information on picking the right size. Choosing the right size is the most vital step to a happy sweater, and a very important element of that is understanding . . .
One of the best things to do to get a great fitting sweater is to measure a sweater that fits you well. However, that does not mean curving the tape measure under the arm. 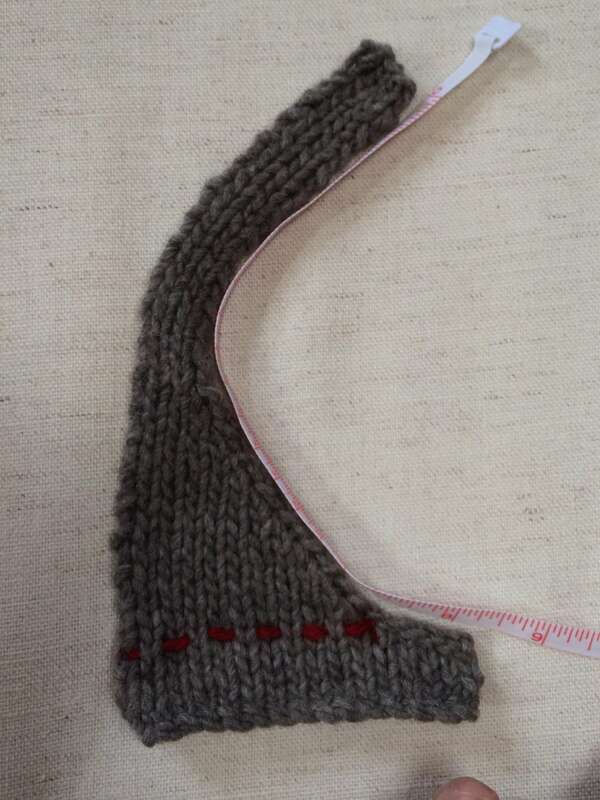 Measure from the shoulder (where the sleeve is seamed into the sweater) straight down. Here is the small of the Corcoran 2.0 and you can see the armhole depth is 7 1/4″. This is a finished garment measurement that is your body measurement + ease. The biggest mistake knitters make is in measuring their body. I often see knitters put the tape measure at their shoulder and wrap it around into their armpit. 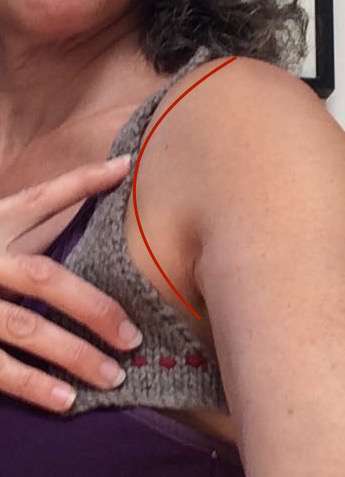 This is not armhole depth, but 1/2 an armscye measurement. Do NOT put the tape measure around into your armpit. So why do we curve around the top of the shoulder, but not under the arm. The answer is in our knitting. But the curve along the top of the shoulder is in the seaming of the two straight armholes together. This 7 1/4″ sample fits me perfectly, with just a bit of ease for comfort. So . . . if I had measured “armhole depth” by curving the tape measure under my arm and got 7″ and then added ease to that I would choose an 8″ – 8 1/2″ armhole depth – and it would be WAY too big on me. When I measure the armhole depth properly and get a little under 6″ and then added ease to it I would choose a 7″ – 7 1/2″ armhole depth and it will fit me perfectly. For more knitting fun, make sure to “like” my new knitting Facebook Page! Awesome tip. I have a question. How does this technique work on a top-down raglan? I guess put the sweater flat, and measure from the top of the sleeve (folded). Is is a right assumption. Measuring the finished armhole of a top down raglan is a bit trickier, as the shoulder is harder to find, or see when not on the body. The best thing you can do is put the sweater on, and then put a safety pin on the sweater right on your shoulder bone, take it off and measure!! Your photos regarding measuring are making the light dawn – thank you for the CLEAREST explanations I have seen about how and wear to measure to get the expected result! One question I have about the style of Corcoran 2.0 – the sleeves look quite tailored, narrow even, and I would like the outcome of the sleeves to be more generously sized to allow for my “mature” bicep dimensions (which are NOT from lifting weights – probably because of not lifting them!). So if I would like a bit less slender or form-fitting look, which measurement will I want to adjust? I imagine adjusting the armhole depth by a wee bit, like a quarter of an inch, may add in just that much more desired ease for the sleeve circumference and emerge as the right size of “cylinder” for the sleeve. Am I on the right track here? Take a look at the schematic (10 sizes) to see if there’s an upper arm and armhole depth that work for you (they go hand in hand). If you just knit a deeper armhole, the sleeve cap won’t fit. However, if you only knit it a tiny bit deeper, it would still be fine. The best thing to do is measure around your upper arm and add a bit of ease to that (1/2″ – 1″). Then look through the schematic measurements to find the size that best matches your upper arm/ armhole depth / cross back. However, with this pattern, I wouldn’t be too concerned, as the lace is quite stretchy and will work with many sizes. Remember if the model has tiny upper arms, the sweater sleeves will reduce (it being a stretchy lace) to fit over her arms. Thank you, thank you, thank you for the clear and concise directions on how to take this measurement. I an looking forward to starting the KAL. 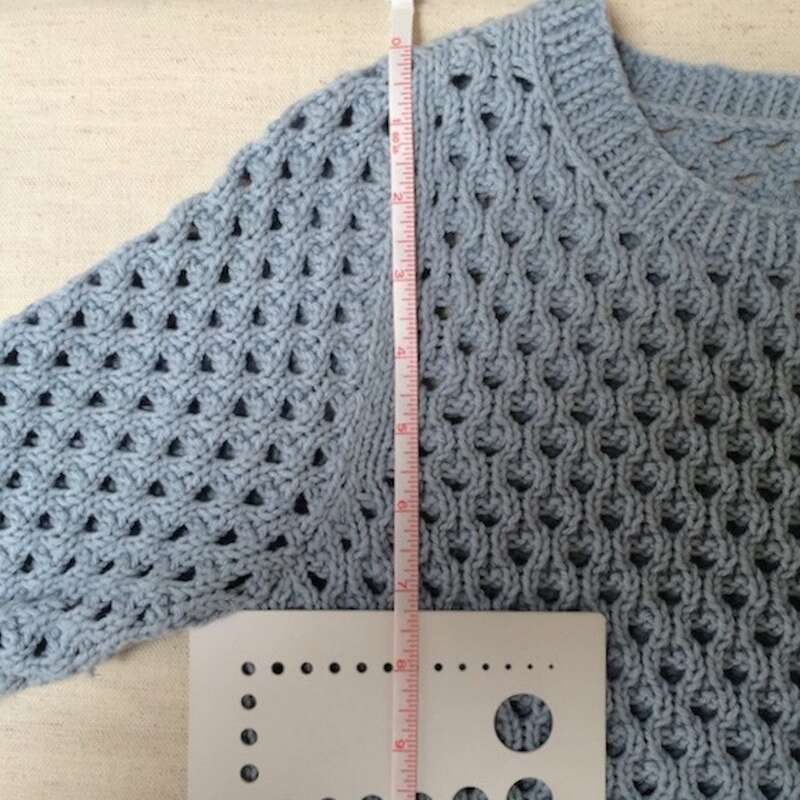 I would like to be able to make my gauge swatch ahead of time but do not know how to knit the Rain Drop Lace pattern. Is there a video or written instructions for this? Thanks in advance for your help. Swatching will be part of the June 20th release. Stitch pattern, video tutorial, blocking etc. 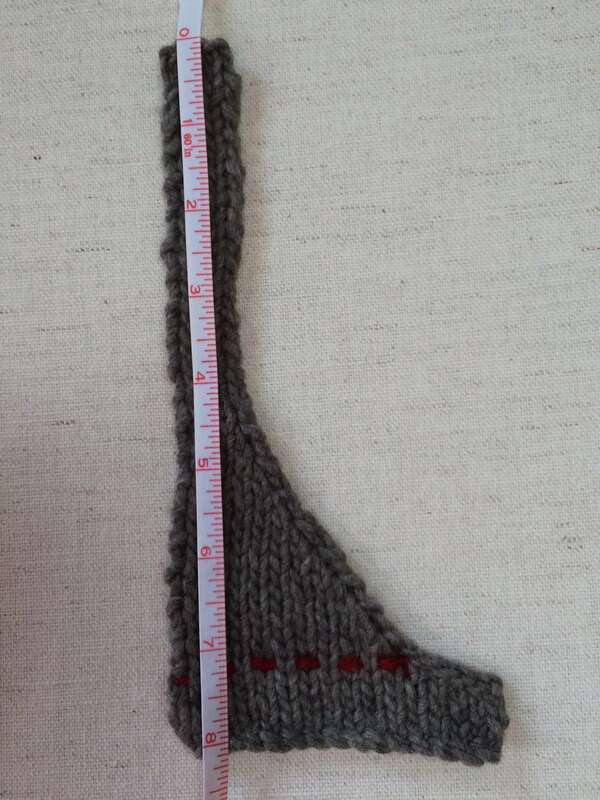 So many knitters so their gauge swatch incorrectly, and are then unhappy with the end result. This is a VITAL step in sweater knitting and it will always be part of my KALs rather than something knitter’s do on their own. Thanks for letting me know so I can relax now and just wait patiently for June 20. Will this measurement work for the top down sweaters as well? I see some cute ones, but they all have that dreaded bulge across the top of the breast that makes it look poorly fitted. Hi, read down a bit in comments about top down sweaters. Remember, a top down is very hard to adjust or alter, as the armhole depth is created by the number of rows worked for the yoke that also create the increases in stitches that get you to upper arm and chest measurement. Hi. Thanks for your wonderful tip. What about measuring a halter neck dress? Should I be measuring from the top collar to the point where I take the bust length, in terms for arm hole length? Are you talking about a body measurement? Armhole depth is your armhole depth, and that’s a body measurement. If you are trying to figure out if a knitting schematic will fit you well, it would depend on how the measurements are shown. Top of collar to the bust is not armhole depth. Do you have a link the knitting pattern you are asking about? I find it much more useful to measure from the back of neck (center) straight down to the horizontal line (where you’ve put the knitting needle). 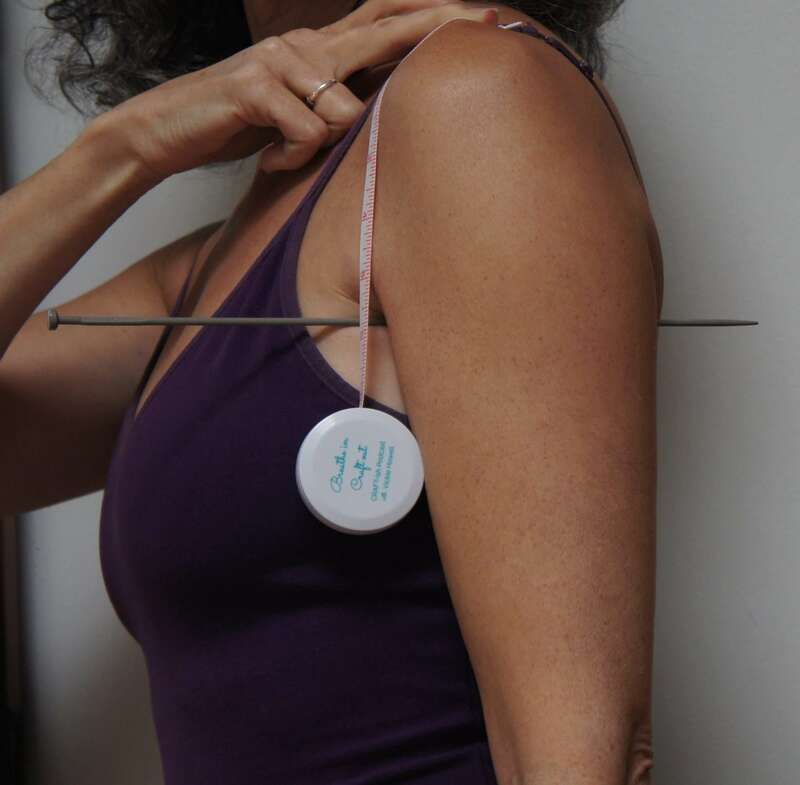 Just put one tape measure around body in the armpit (knitting needle) and have the patient hold it there, while I measure from center back of neck, straight down to the line. Also note if their shoulders are very sloping, or very square, and also if they are very narrow or broad. Armhole depth on knitwear is to the lowest part of the shoulder, so if measured from the center back you will be knitting an armhole depth that is actually the depth of the armhole, plus the rise of the shoulder, plus about another inch to the nape of the neck. The shoulders (and if they are sloping or square) will not effect this part of your knitting, but rather the shoulder shaping. Please Patty, How can i get the standards for that of mens official shirt ? Please Patty, you could use some patience I am really new to all this.